A free update to Star Wars Battlefront went live yesterday, adding a new Survivors of Endor multiplayer map that supports the Walker Assault, Supremacy, and Turning Point modes, and a new Survival Mission on Tattoine that can be played either solo or cooperatively. 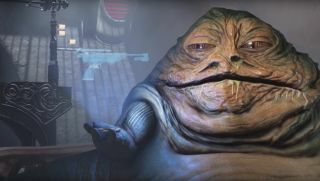 Speaking of Solo, it also promises the upcoming arrival of Hutt Contracts, which means you'll soon be able to spend some quality time with everyone's favorite giant space slug. The Jabbster appears only briefly in the video—very briefly, since the whole thing is only 30 seconds long, ten of which are dedicated to logos—but Eurogamer surmises that contracts will give players the opportunity to unlock new gear, like the DL-18 blaster or some variant of the DLT-19 heavy blaster, both of which Jabba seems to have available. The actual nature of the contracts hasn't been revealed, but as GamesRadar noticed, when Lead Designer Dennis Brännvall was asked on Twitter if they'll be bounties or challenges, he answered in the affirmative. Hutt Contracts, and more information about them, are coming soon, according to Brännvall and the trailer, while the rest of the update is already live.